He said the incident occurred in their matrimonial home located behind African Church in Owode-Ijako town of the state. 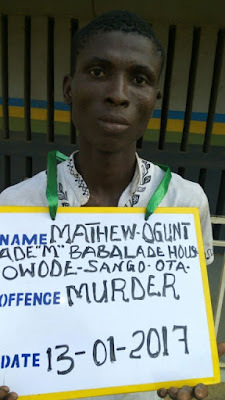 The police spokesperson said during the scuffle which started at about 1.00 a.m. Mr. Oguntade allegedly strangulated his wife to death‎, threw her body outside through the window and fled their home. He added that the chairman of the community’s Development Association, Iskilu Kareem, reported the case to the police. Mr. Kareem said he had received a telephone call from a member of the vigilante group in the area that the couple were into a serious scuffle. But before he got to the house, the man had committed the act and ran away. “The DPO Sango Ota, SP Akinsola Ogunwale, led detectives to the scene and removed the corpse to General Hospital, Ifo morgue before launching serious manhunt for the suspect. Their efforts paid off the following day when the suspect was apprehended and taken to custody,” Mr. Oyeyemi said. The spokesman said the commissioner appealed to members of the public to always alert the police whenever their neighbours were engaged in physical conflict in order to avert this type of ugly incident.